Hi everyone! I hope you’re sewing at home with the guild on this snowy Saturday. Check Instagram (@njmqg) and Facebook for pictures of what members are working on, and be sure to tag your images with our hashtag #njmqgopensnow. We’ll be having giveaways each hour, so stay tuned! Here is the part of the meeting where I usually stand and talk. —Our next meeting will be Thursday, February 26 (one week later than we usually have it, make note!) at 7PM at Rock Paper Scissors. We will be having a mini quilt swap! Quilts should be no smaller than 16” and no bigger than 24” on a side, and we encourage you to try a technique, color, or shape you’ve never tried before. If you bring one to the meeting, you get to take one home. —Our March meeting is Thursday, March 19. —Aleeda is organizing a retreat at Cross Roads retreat center the weekend of March 20-22. We’ll have a separate blog post with more information for those who want to sign up. This sewing weekend is always a hit and a great chance to learn from each other. —On May 1 and 2 we will be hosting Heather Jones for a lecture (Friday) and workshop (Saturday). Check out her website oliveandollie.com and her Instagram feed instagram.com/heatherjonesstudio for more about her and her quilts. We’ll have registration information for the workshop soon. Priority will be given to NJMQG members for the 20 available spots. — Stella has a fun new bee concept for our members. It will be done in smaller groups on a quarterly basis– no more yearly commitment. More details on this soon. —Our home base Rock Paper Scissors is featured in the latest issue of Generation Q magazine! Beth has ordered extra issues, which will be available at the store in the days and weeks to come. 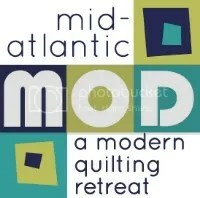 — Quiltcon starts February 17! Keep an eye out for news and pictures. Members Betsy Vinegrad and Melanie Tuazon both have quilts in the show, and Beth Rowan will be doing her substrate demo at the convention center in Austin. — Finally, a huge THANK YOU to everyone who contributed time and effort to our beautiful Quiltcon charity quilt. Check out pictures here: https://njmqg.com/2015/01/09/our-finished-quiltcon-charity-quilt/ . Did you see that we were featured in the MQG’s global newsletter? Such an honor. Do you have an announcement or event you’d like to mention? Please do so in the comments. ← Open Sew January 24 CANCELLED – Online Open Snow instead!